Completed Care England responses to consultations are available in the Members only section or send request to jgecsei@careengland.org.uk. Care England’s analysis of the assumptions behind the original Impact Assessment to this Bill, dated 29 June 2018, found a worrying number of misleading assertions and dubious assumptions. During the Bill’s progress through Parliament - which is still ongoing – an extraordinary number of amendments have been tabled in both Houses of Parliament. These have led to some welcome changes, but the level of disquiet among stakeholders remains high. This practical tool enables the creation of a recorded, person-centred care plan, which will provide evidence of consideration of the MCA key lines of enquiry that are pursued in all inspections of services for people aged 16 or over. In particular it ensures that decision-makers understand the legal framework of the MCA, and that care interventions are planned and delivered within an embedded search for the least restrictive option that will meet an identified need. There is relevant information which will enable accurate, person-centred care planning within the empowering ethos of the MCA. 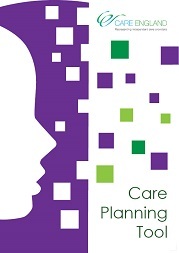 Non - Care England members can purchase the Care Planning Tool for £40. 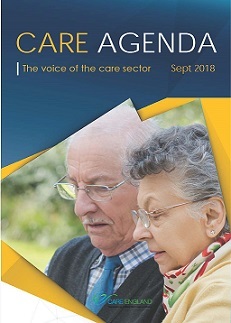 The Care England monthly mgazine, Care Agenda, contains an authoritative overview of the latest developments in regulation, legislation and government policy. It also features regular articles from experts on a wide variety of care related topics (e.g. risk management, human resources, insurance, planning application). Care England collected a total of 84 responses from care home managers to look into how successfully the Mental Capacity Act (MCA) was being implemented on the front line of residential care. Respondents answered questions on the five principles of the MCA, and the questions asked how well they lead and supported their staff teams to understand and enact these principles. Can we expect to see a fair rate for CHC? From 1 April 2014, the price payable by the NHS for health care services became subject to the ‘2014/15 National Tariff Payment System’ published by Monitor. Monitor has agreed to conduct an inquiry into whether Gateshead CCG followed the applicable rules within the National Tariff. Care England welcomes the decision of Monitor to launch an inquiry into how Gateshead CCG has set the feees for Continuing Healthcare. Finding Common Purpose, developing strategic commissioning relationships to support people with learning disabilities, is based on a recent workshop held by the two organisations. It is an important insight into issues either side of the commissioning fence; workshop participants included not only social care provider chief executives, but also senior local authority commissioners. The content of these PDF materials are protected by copyright law. The copyright remains with Nottinghamshire Healthcare NHS Foundation Trust and NHS England. Reproduction or retransmission of these materials, in whole or in part, is allowed, however you must preserve any copyright or other notices contained in or associated with them. You may print copies of these materials for personal use or to distribute to staff members. The content of these PDFs cannot be altered without prior consent. In addition to teh key findings presentation, the results are available through the NHS Benchmarking site.